The specified CGI application misbehaved by not returning a complete set of HTTP headers. The headers it did return are "Can't locate MT/Bootstrap.pm in @INC (@INC contains: lib D:/Perl/site/lib D:/Perl/lib .) 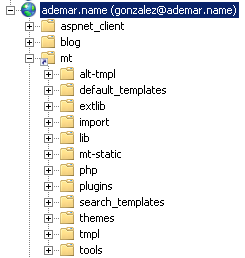 at \\nas-005\winspace\10-ademar.name\www\mt\mt.cgi line 11. BEGIN failed--compilation aborted at \\nas-005\winspace\10-ademar.name\www\mt\mt.cgi line 11. ". p. To solve this you need to convert the folder containing the Movable Type installation into a virtual directory. Lets say you are installing it in folder mt, then you need to create a virtual directory with the same name pointing to the folder in question. p. I’m not sure how wise is that change but it solves the problem.